ITW Dynatec designs, manufacturers and sells a full range of cold and hot-melt glue application equipment for the Disposable Hygiene, Coating & Laminating and Packaging industries worldwide. Click on the links below to learn more about our equipment. ITW Dynatec offers a wide range of adhesive applicator machines including slot, bead and adhesive spray technologies to meet your application needs. All of ITW Dynatec’s adhesive applicator machines are designed to provide accurate, repeatable results, providing value to the customer. The Hot Melt Ahdesive Pattern Controller is one component of an adhesive application system consisting of a hot-melt unit, cold glue pressure vessel or cold glue pump, adhesive hoses and applicator heads. The controller can be used for hot melt or cold glue application. The pattern controller activates solenoids for the applicator heads in order to create individual adhesive patterns. Hot melt adhesive supply hoses are electrically-heated, flexible conduits designed for the transfer of hot-melt material from an adhesive supply unit (ASU) to an applicator (head or handgun). Our patented Gemini™ hoses are equipped with an extra heater and RTD sensor and a switch assembly which allows the operator to switch the hose's operation between the two, providing a back up system. This hot melt hose works with a wide variety of hot melt machines. 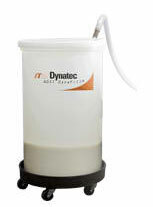 When it comes to hot melt glue supply units ITW Dynatec leads the industry. We manufacture a complete line of innovative adhesive supply units for low, medium and high-speed operations. No matter what you need, Dynatec has the right hot melt adhesive supply unit to fit your needs. Bulk hot melt adhesive drum unloaders provide an uninterrupted flow of hot melt adhesive for high volume production lines. Drum unloaders allow a full drum to be staged and used as needed, simplifying operations. ITW Dynatec Cold Glue applicator machines are used by companies across the globe to apply cold glue to their products and packages. 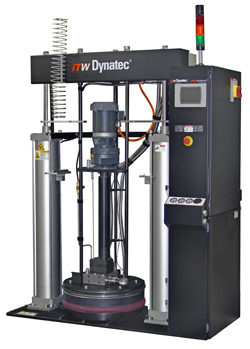 Click to learn more about the full line of cold glue applicator systems from ITW Dyantec. Hot melt adhesive feeders automatically transfer hot melt adhesive from any style bulk container to the adhesive supply unit, increasing productivity and reducing equipment down time by keeping the adhesive supply unit full of hot melt glue.